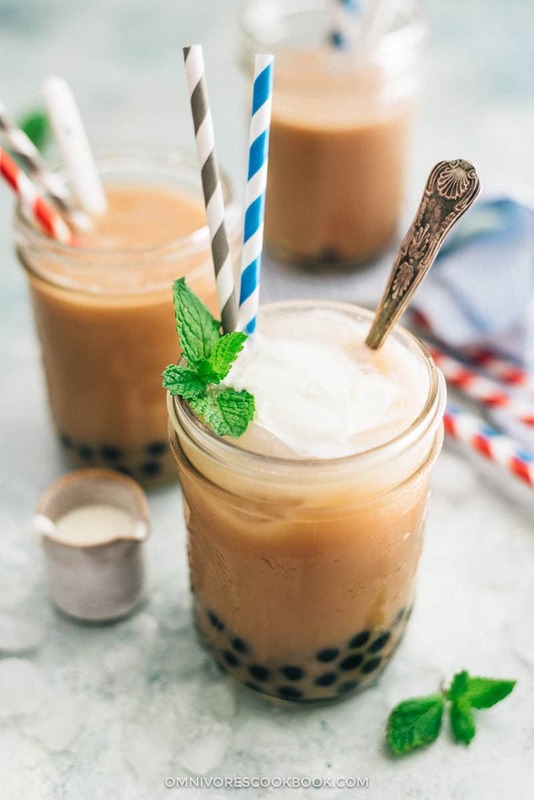 Want to learn how to create that rich and silky bubble tea, proper Asian street vendor style? Here is how. Thank you Domino® Quick Dissolve Superfine Sugar for sponsoring this post. Visit your local retailer to pick up your own package and start sprinkling sweetness today! Around the 80’s and early 90’s in China we had very little options for food and drink. When I was in elementary school, only three types of beverages existed in my family: hot milk mixed with a tiny bit of Nescafé, hot orange juice made from Tang (instant powder), and a hot drink made with Lacovo (also an instant powder) that tasted like chocolate malt balls in a cup. More foreign brands started to show up in the late 90’s. I still remember how excited I was when I learned that the first Hong Kong bubble Tea branch RBT had opened in Beijing. I was amazed by the fact that you can go to a special store just for drinks! Everything drew me in immediately: the small wooden table with chairs made like swings, a rustic looking floor made out of cobblestones, and of course, the rich smooth milk tea with sweet tapioca pearls. The bubble tea cafe became my favorite place to hang out with friends after school. My classmates and I spent hours in the store for a more extravagant party to celebrate our group assignment winning the first place in class. Even after I graduated from college, I would still go there several times a month to have an afternoon tea session with my mom. We always ordered fried tofu with gravy, salt and pepper chicken wings, curled French fries, and two giant glasses of milk tea. For me, bubble tea is not just a drink. It represents party time with friends, reunions with family, and celebrations of small achievements in daily life. The tradition continued after I moved to the US. 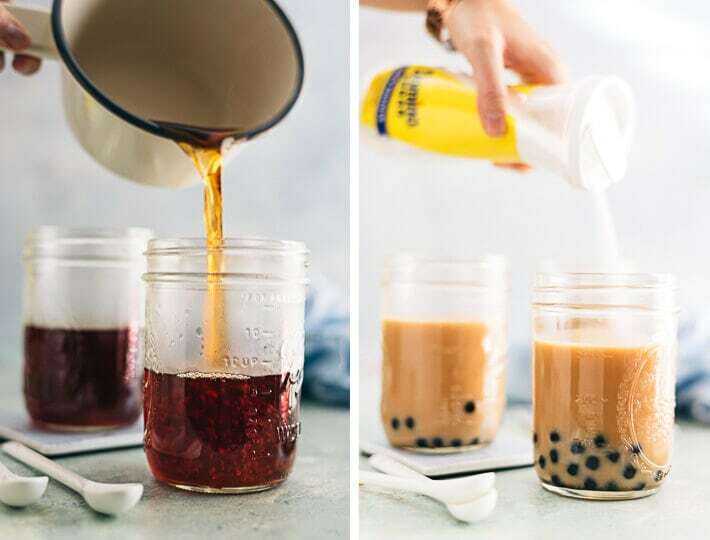 Although it is super easy to make a cup of bubble tea, here are few things you can do to make it even better. You don’t need a premium tea, just remember to brew very strong tea. If you are using tea bags, use 2 to 3 bags per 1.5 cups water. Also, you should simmer the tea for at least 5 minutes so it creates an extra strong tea. In fact the best option for bubble tea is Sri Lanka black tea powder. It is a type of cheap tea blend that looks almost like ground coffee. Asian bubble tea vendors use it to create the super rich taste with a lower price. Having said that, it can be difficult to find, so just choose any cheap options you have. Don’t worry that the tea will be very bitter. We’re going to add a lot of cream and sugar to it later, which mellows out the bitterness. Heavy cream is the best option. Our goal is to create that rich and silky drink that you get in an Asian bubble tea stand. I found heavy cream is the best choice to re-create that perfect smoothness. If you want to make a vegan drink, use coconut cream as an alternative. On the other hand, you can use milk, low-fat milk, or plant-based milk if you want to create a healthier drink. 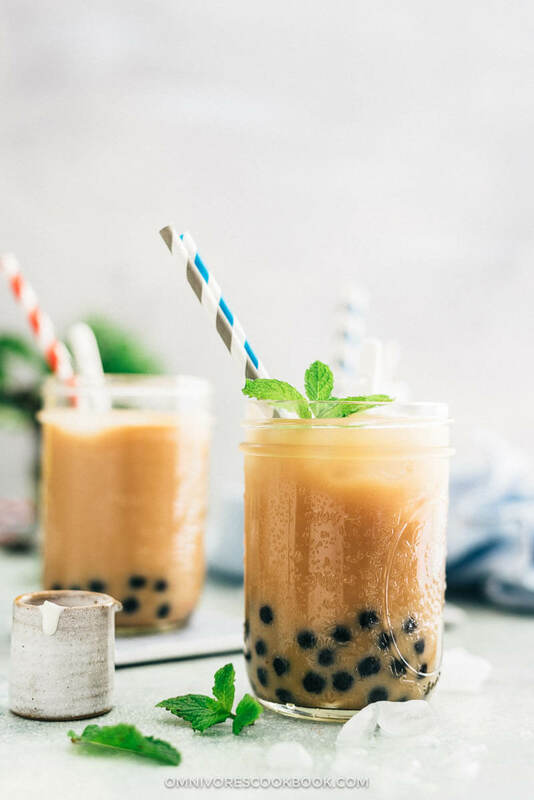 In this case, I’d suggest you to chill the tea in the fridge instead of using ice cubes when serving, so the ice won’t further water down the bubble tea. Sweeten the tea before serving, but do leave the option for your guests to add more sugar. 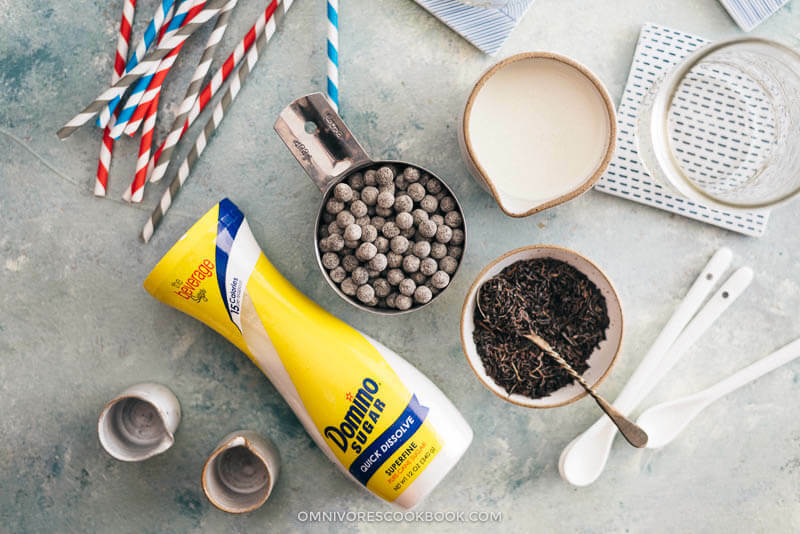 I love to serve the tea with Domino® Quick Dissolve Superfine Sugar. It has finer sugar crystals than those found in traditional granulated sugar, allowing it to rapidly blend when sweetening your drink, no matter whether it is hot or cold. I firstly use the sugar to marinate the tapioca pearl. 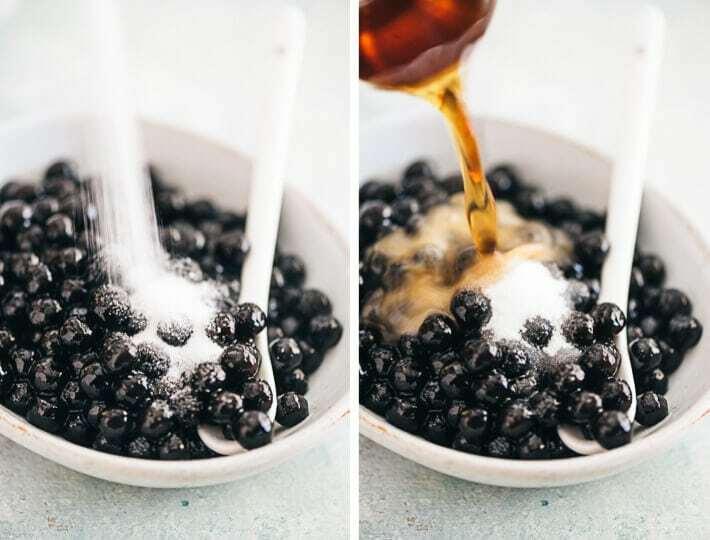 The sugar melts with a few stirs, which makes a quick no-cook syrup that preserves the tapioca pearls. 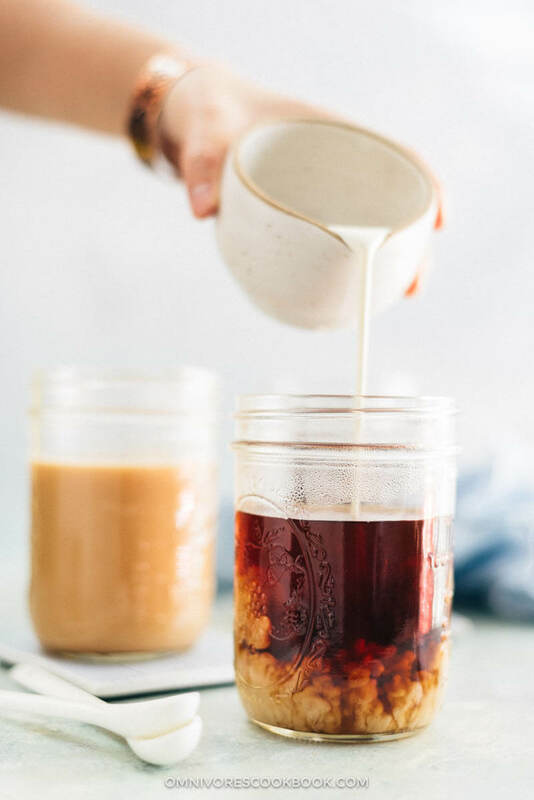 I only mildly sweeten the tea, however, I do leave the sugar bottle on the serving tray, which allows everyone to customize their drink to their taste. The sugar has an easy-to-use dispenser with a re-closeable flip-top lid, which makes serving and pouring so convenient. Domino® Sugar is sold where I live, but if they don’t sell it in your area, look for C&H® Sugar, the sister brand of Domino® Sugar. Prepare the tapioca pearls beforehand, but not too early. I always prefer to cook the tapioca pearls the day I serve the drink, because they taste the best when they are fresh. The longer they sit, the tougher they become. Instant tapioca pearls are super quick to prepare, as little as 10 minutes in total, but they have a shorter shelf life. The cooked ones keep well at room temperature for about half a day. However, they turn rock solid in the fridge after a couple hours. Regular tapioca pearls require about 30 minutes to get ready, which is a great option if you plan to cook them 1 or 2 days before serving. They will toughen up in the fridge, but are still edible. A word of caution when serving. 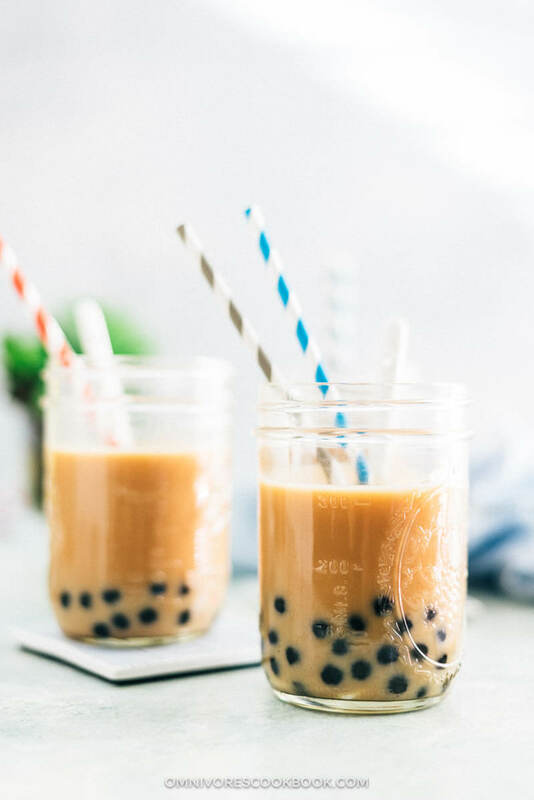 Despise the fact that most Asian vendors use the type of super fat straw that allows you to drink and enjoy the tapioca pearl at the same time, I suggest you don’t. Sometimes you might accidentally swallow the tapioca pearls along with the drink, and once in awhile they get stuck in your throat. That’s why I always prefer to use a thin straw with a spoon, so you can easily access the drink and the pearls safely. Domino® Sugar is hosting a giveaway on Instagram to help one lucky winner host a family gathering of their own! The prize will be a $500 gift card plus one of each variety of the Flip-top sugar products. The giveaway is live now and will end on June 21st. Head over to enter for a chance to win! I hope this post helps you make a killer drink for your next party! If you give this recipe a try, let us know! Leave a comment, rate it (once you’ve tried it), and take a picture and tag it @omnivorescookbook on Instagram! I’d love to see what you come up with. 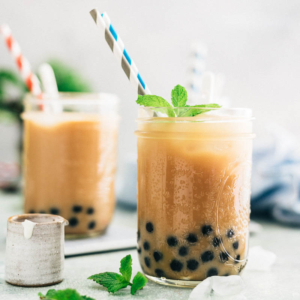 Want to learn how to create that rich and silky bubble tea the proper Asian street vendor style? Here is how. Add 8 cups water to a small pot and bring to a boil. Add tapioca pearls and stir gently until they float to the top. Cook over medium heat for 15 minutes, until the tapioca pearls turn tender throughout, but still a bit chewy in texture. Remove the pan from the stove, cover, and let rest for 15 minutes. Drain tapioca and transfer to a small bowl. Add sugar and 1/4 cup water. Mix well with a spoon. Marinate at room temperature for 15 to 30 minutes. You can use the tapioca pearls now, or store them in the fridge until ready to use. They will taste the best when fresh, but you can store them for a couple days. Their texture will become chewier the longer you let them sit. Add 8 cups water to a small pot and bring to a boil. Add tapioca pearls and stir gently until they float to the top. Cook covered over medium heat for 2 minutes. Removed the pan from the stove and let steam covered, for another 2 to 3 minutes, until the tapioca pearls turns tender throughout, but still a bit chewy in texture. Drain the tapioca pearls with a sieve and run under tap water for a few seconds, to stop cooking. Drain again and transfer to a small bowl. Add sugar and 1/4 cup water. Mix well with a spoon. You can use the tapioca pearls now, or place them in room temperature for half a day, until ready to use. Add 6 cups water to a small pot and bring to a boil. Add black tea and simmer uncovered over medium-low heat for 5 minutes. Stop heat and let the tea steep, covered, for another 5 minutes. Strain tea with a very fine colander or coffee filter (or remove the tea bags). Add the tapioca pearls into each glass. Pour in 1 1/2 of the black tea and 1/4 cup heavy cream (or 1 cup milk). Add 1 tablespoon sugar or to taste, mix well. Serve the drink hot, at room temperature, or add ice cubes to serve it cold. 1. Like I mentioned in the blog post, instant tapioca pearls are easy to cook and they taste the best when served fresh. However, if you want to prepare them at least a day ahead, use the regular type instead, or they will turn too chewy when you’re ready to serve.